Below is a partial list of upcoming Seminole War reenactment events. A typical Militia Man of the early 19th Century. Upcoming Seminole War reenactment events. The following list is not a complete one. Nor does the Florida Frontier Guard participate at all of them as individuals, or as a group. For more information on these events, see the attached links and contacts for event details and requirements. Annual pre-1840 fur trade Rendezvous event at Ft. Foster. Battle reenactments and fort tours both days. Okeechobee Battlefield State Park, Okeechobee, FL. Regular infantry, Missouri Volunteers, and Seminoles needed. Battle reenactments both days. Held on portion of actual battlefield. Cooper's Battalion Training Day. Fort Cooper State Park. March 3, 2018. 10-11:30 AM. Park Pavillion. This is an introductory program to Seminole War living history and reenactment participation. Parties interested in Seminole War reenacting are encouraged to attend. Contact J. Marshall at: Generalclinch@yahoo.com for more information. Fort Cooper State Park, Inverness, FL. Battle reenactments twice daily. Georgia Militia, some regulars, and Seminoles needed. Held on actual site. Friends of Fort Cooper website. Fort Christmas Living History encampment. Living history encampment with two programs daily at Fort Christmas Historical Park, Christmas, FL. Fort Christmas Historical Park Living History. For spring and fall each year, or the weekend before Easter, and weekend before Thanksgiving. For more information call the park at (407) 254-9310. Website: Fort Christmas Website. Attack on Fort King, Ocala, FL. Candlelight Tours/Battle Re-enactment at Fort Foster. At Dade Battlefield Historic State Park, Bushnell, FL. Loxahatchee Battlefield Preservationists (event volunteers). Fort Chokonikla Living History, Payne's Creek State Park. Dates to be announced; ca. February, 2019. Payne's Creek Historic State Park, Bowling Green, FL. 1849 Seminole Campaign living history encampment. Held on actual site of Payne’s Creek trade store massacre, and of Ft. Chokonikla, 1850. For more information, contact park at (863) 375-4717. Payne's Creek State Park website. Burn! 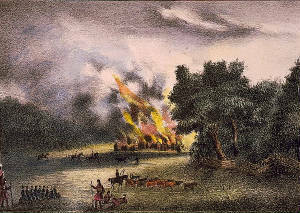 South Carolina Volunteers torch a Seminole Village in Florida, 1836.